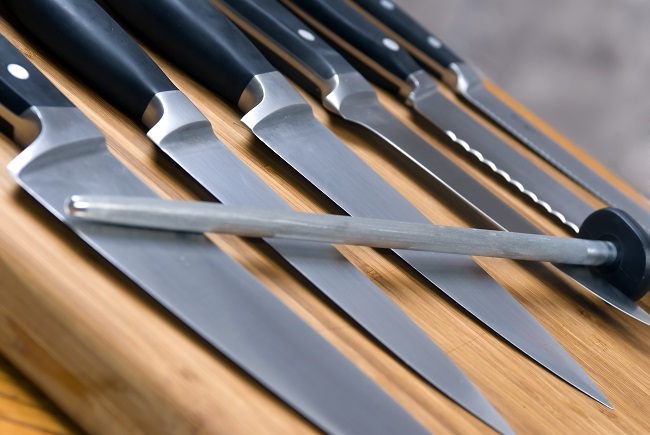 At The Cookline, we know that your kitchen is the backbone of your business but also cutlery is just as important. It is easy to fall victim to the glut of cutlery on the market today. Indeed, from the cheap pieces hawked by multilevel marketers to the single-use specialty knives found in stores across the country, finding a solid, workhorse chef’s knife can be a trying task. Nonetheless, there are gems to be found in stores and online, the best of which we’ve curated for you. While on the slightly shorter side, the Global 7 Inch Chef’s knife is a versatile and reliable piece for a chef who isn’t afraid to get into the nitty-gritty. The unibody design and high carbon steel blade make it exceptionally resilient to degrading, meaning you won’t have to worry about sharpening when you need to get to work. This Japanese knife has a dimpled designed that prevents sticking, perfect for working with produce, cheese, or other adhesive mediums. The wooden handle also provides exceptional grip while working in a messy kitchen environment. Similar to the Enso, this knife’s grip is no-nonsense, though it is also a bit beefier. The ultra-thin blade is perfect for slicing and dicing through meats and produce alike. It’s a true utilitarian kitchen tool made with the utmost attention to detail. While the Santoku is a departure from the more traditional chef’s knife design, the ridged dimples and hollow core blade are innovative features from a true German icon. The hollow edge design provides unparalleled sharpness, while the classic Wusthof grip is one of the best available, especially for the price. There’s a reason Shun has the reputation that they do. Their knives work, out of the box or years old, with very little in the way of wear. While not the most expensive knife on the list, the Shun’s smoothed wooden grip and dimpled blade cut with ease through anything you put in front of it, making it truly the best knife for the money available today.